So simple, yet so difficult. But yet that's what the bible commands. Of course it's literally impossible to always always feel or show great joy and delight. Life is hard. Things are hard. Economies are not particularly smiling. Refugees are being turned away. An entire religion is basically facing rejection. Heck, Northeastern Nigeria, South Sudan, and Yemen are on the brink of famine. So I get it; there is not always something to be happy about. 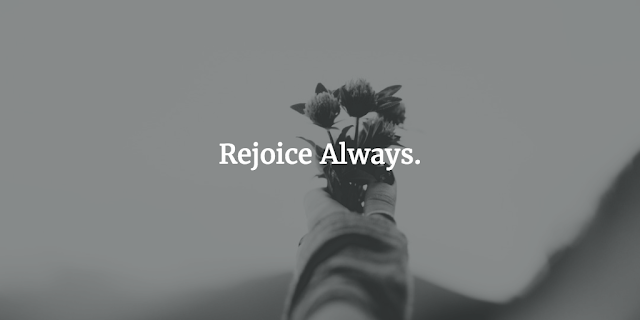 Rejoice anyway. Be thankful anyway. And pray anyway. These two words carry so much power. How can one apply these to daily living? By not letting current events and circumstances call the shot in your life. By not letting current happenings determine your joy and happiness. By trusting not in what you do not know about the future, but in what you know about God. So you see, it's quite simple. But it's also quite difficult. I hope you and I will continually think about this. I hope we will think about how to have a happy disposition towards life.